Following the successful opening of the rebuilt click Mombo and click Little Mombo in January 2018, Wilderness Safaris has not only unveiled Mombo’s new spa, gym and 12.5-metre lap pool, but also welcomed a full-time yoga instructor to the camp, offering an unrivalled health and wellness experience in the heart of this pristine wilderness sanctuary in the Okavango Delta. The new spa room is a relaxing retreat for guests wishing to enjoy a range of signature treatments, including Mombo’s Soul of Africa massage, which uses marula oil mixed with Floral Blend (a product comprising Cape snowbush, geranium and jasmine) to soften signs of aging through its anti-stress action. Other treatments include body and scalp massages, facials and body treatments, as well as manicures and pedicures. “Obviously all of these treatments can still be enjoyed in the luxury and privacy of guests’ tented suites; guests can now choose what option suits them best and tailor make their experience to suit their specific needs”, said Mombo GMs, Matt McCreedy and Robyn Dreyer. “We are also thrilled to have rebuilt our fitness room, which features new equipment including a sitting bike, two treadmills, rowing machine, Pilates balls, kettle bells, etc. There is also a fridge in the gym with isotonic drinks like coconut water, and a convenient shower room should guests prefer to freshen up there before game drives”. An exciting addition for yoga fans is the permanent employment of yoga instructor, Reneé Klopper. Yoga sessions are offered at both Mombo and Little Mombo and although the classes are mostly conducted at the gym/spa area, they can also be held in a variety of bush locations. There are no extra costs involved; this is simply an addition to the incredible wellness offering at the camp. 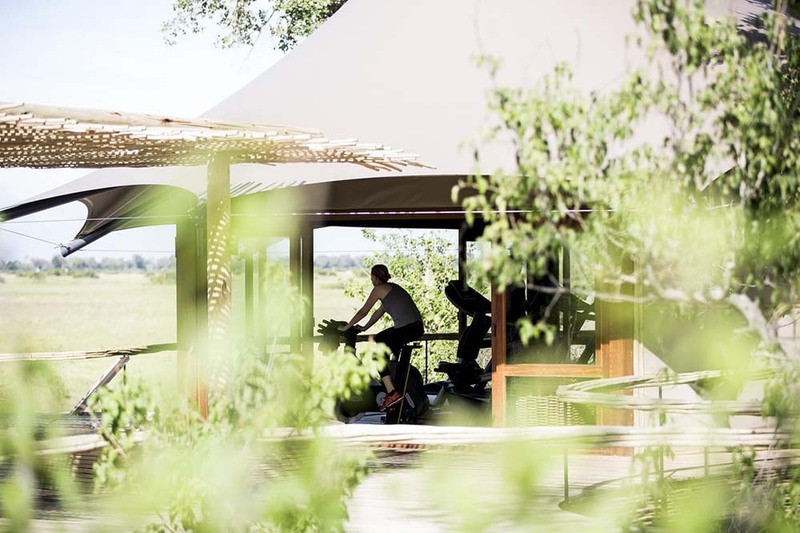 “Our spa and gym area overlooks a beautiful part of the concession, making it the perfect place to either destress or to work off some of our delicious food offerings, whilst taking in the sights and sounds of this idyllic bush setting”, said Matt and Robyn. “We were also vigilant in choosing environmentally-sound spa products that will protect this pristine ecosystem, selecting Africology as our preferred range”. All Africology products are eco-friendly, 100% biodegradable and comprise only natural ingredients. This highlights Mombo’s commitment to operating with as light an eco-footprint as possible. Considered one of the best wildlife areas in Africa and renowned as the “Place of Plenty”, Mombo’s commitment to Wilderness Safaris’ 4Cs sustainability ethos (Commerce, Community, Culture and Conservation) ensures the protection of this pristine wilderness concession and its enormous number and variety of fauna and flora. Each and every guest plays a vital role in ensuring the conservation success of Mombo. It is a place of harmony: a balance between the camps, the environment and the people who stay here.